“… and no matter what happens, be sure to enjoy the race.” Jo Ann (Florida-base runner) called out as I followed my pace group to the start. It was a mantra that thankfully I adhered to from my teammates and the night prior—my boyfriend. I kept that in mind for every mile. 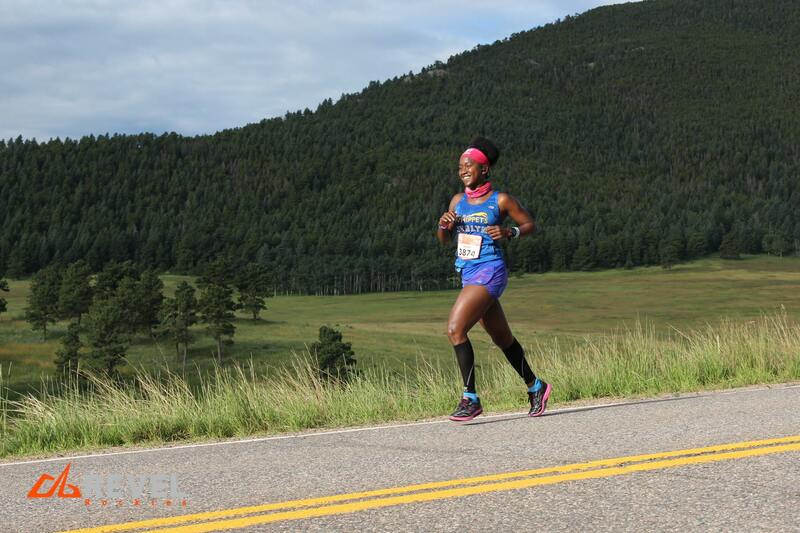 Jo Ann told me about the Revel Rockies in January when I paced one of my good friends, Delvin, for her first marathon—Disney Marathon. I’d certainly look at it, I promised. I had learned to trust Jo Ann’s suggestions. She’s a marathon maniac who I had met at the Diva’s Half in Puerto Rico. She has a beautiful spirit like most of the leisure runners I’ve been meeting on my endurance runs. By January 28th I had paid for entry ($104.99), booked the hotel ($277.61) and selected the flight ($290.20). I was going to run my 7th marathon. To be honest, Jo Ann’s mentioned about my attempting to BQ (Boston Qualify) at this race sparked my curiosity. Prior to that, my only goal had been to run any distance and PR (Personal Record) as much as I could. A few months later, Matt Wong (from the Dashing Whippets Running Team) said in passing during a track meet, “Jerlyn when are you going to BQ?” I started slowly believing that I could and decided that, “Maybe it definitely is possible.” Even if I had scheduled the North Face Endurance 50-miler in May, my goal shifted between training for it well to Revel Rockies. I kept my MP as is and my long runs were specific to maintaining marathon pace. All of a sudden I had sparks of confidence from Michelle Mason and Annette Vega, also from the DWRT, who encouraged me to train to BQ. Then I was told, “Jerlyn it’s almost every runner’s resume dream to Boston Qualify, you’re talented, you can run many marathons back-to-back most people’s body can’t handle that.” I’m truly lucky to have had so many people believe in me. Then, I got really worried. When I looked at the Revel Rockies course I realized it was a mostly downhill course starting at 10,297 ft elevation ending at 5,759 feet. Coach Simon and I had a conversation: “Have you ran in altitude before?” Thankfully Simon and I spoke prior to heading to Denver because suddenly everyone who had been to Colorado advised to drink lots of water. I started a week and a half out drinking at least 70+ oz per day (plus at least one Gatorade). Simon gave me confidence that my body would have enough oxygen since I was arriving the day before. I trusted him. Weeks leading up to the race I researched as much as I could. On July 18th, I flew in to Denver. I picked up a Hyundai Sante Fe ($464.98—Pricey because I had to upgrade) and made my way out ~40 miles to the Steinhauer Field House for bib pickup at the REVEL Rockies Expo. Right after the Expo, I proceeded to the Hampton Inn (~4 miles) where I would be staying. One of my concerns for running this and attempting to BQ was wondering what state I would have been in proceeding the marathon. I didn’t know if I would have been injured, since that has happened before and, I hadn’t driven in practically over a year. That was a stress factor since I didn’t have anyone along with me who drove. I made do anyway. After carbing up at Carrabba’s Italian Grill (~2 miles from the hotel) I made plans to be at the start at 3am to get on the shuttle (~6 miles away) by 3:30 am on July 19th. The morning of, I drank a serving of Chocolate Generation Ucan (Whippets get a discount by the way) with coffee (my usual ritual of bagels with peanut butter, banana and apple are over) on my way over to the shuttle location. I was on the 2nd shuttle where Troy, a local also running the marathon, sat next to me. We made small talk for a ~45 minute drive up to Echo Mountain off Squaw Pass Road. When we arrived, I met and huddled with the other marathoners. Since it was 53 degrees out, they gave us foil and hand gloves. We were incredibly thankful. I walked around for a bit before being joined by Jo Ann and some of her marathon maniac friends (some of these runners had done 80+ marathons). It was announced that the race was going to be delayed but thankfully only 10 minutes. At 6:10am, we made our way to the start to follow my pace group. I didn’t see him right away. Initially I figured the strategy would be to stay with the 3:35 group (I trained for 3h 30m) and leave in the last few miles. I was relieved when I saw him a minute before starting and discouraged after he admitted his watch died the night prior so “We will be running by feel speeding up on the downhills and maintaining on the inclines. Can someone let us know when we are going too fast or too slowly? What pace are we at now?” A pair of runners ahead of us called back, we are running at 7’15” pace. Shocked! I know I didn’t train for 7’15 and even if that felt great at the moment there’d be no way I’ll hold it for 26.2 miles. Discouraged, I made the decision to go off on my own. After all, this wasn’t my first marathon and no matter what happened, I trusted what I trained for. The start of the first half was incredible. I love running downhill. It’s certainly my strength. I flew, at a very consistent sub-8 (but of course I didn’t prevent myself from going faster where necessary). However, every time there was a sudden incline, there was a struggle to breathe. So, I’ve only ran once in altitude, if you want to call it that. Just barely above 3,000 ft. I remembered walking those hills, I remember not being able to maintain my breath. This occurred again. Despite these hills being no where comparable to Harlem Hill, that I trained on, or like Cemetery Hill in Van Cortlandt, they felt like them. Even if I slowed each breath felt like I was struggling. Immediately I realized this would be what would affect my goal. Nonetheless I kept hope. “The Thirst”—I should have been a local. The night prior I became suddenly thirsty before bed despite the water I had been having. This phenomena was occurring again. On the way over, Troy said that had been his issue when he first moved to Colorado. The thirst. While running, I wished I had packed my camelbak because I stopped at all 13 aid stations. The distance between each stop became unbearable eventually because I just felt my throat drying. I have no idea who the women in the beginning were who were running at the 7’15” pace but they looked deceivingly well-prepared for this race. When I passed them near the 2nd half I was really surprised that I had. Troy had also passed me (his goal was faster) but he was a local and clearly enjoying the run. A few others kept up and eventually fell behind. Somehow I didn’t feel so bad when I lagged behind. Nothing was hurting so it became apparent how much effort I had used to breath that made me dial back. I pretty much walked every incline to get my breathing down. Regardless of how it was going, I felt ease. There wasn’t pain. It was nice to have a 4 minute buffer from my goal by the time I was running the 2nd half of the race (thank you pace bracelet—I’ve learned to depend on the Garmin for nothing more than time). I figured the brief walking that I did wouldn’t affect me. I was wrong. The walking increased more and more. I became aware that the 1st half of the marathon was deceiving. The 2nd half was much more difficult. Instead of a straight-shot downhill (that I was sold), I was introduced to rolling hills. Even if they weren’t terrible, my breathing became increasingly tough. Somehow someone decided it was a great idea to have a steep hill here and there. Was this torture? I’ll be honest, I always finish every marathon the same way even if I enjoy running them: I want them to be over, I want to cross the finish line and have my beer. For Revel Rockies, I did the same thing—my official 7th. I heard that a guy who had previously BQed did close to 5 hours on this run. A run that was certainly way off from my goal but when I compared, I wasn’t that far off. Apparently, I had been overly ambitious and underestimated running in altitude. Otherwise breathtaking view (5 stars) and course support (5 stars) made me happy that I took the time to enjoy the race. As usual, you learn from the course and prep for the next one. I’ll be attempting the Marine Corps Marathon next. As for my BQ dreams, I’ll return with a healthier strategy. P. S. The half marathon from Revel Rockies this year was cancelled due to lack of buses on race day. To find more information on this check out their website for details. Also, the photos for this event are free!